Come and join us for our annual open day, everyone welcome. If you are interested in joining our club, come and see our facilities, meet members, committee members and join in the fun. We will be running a friendly tournament for adults and juniors throughout the afternoon. Ian Tooms from IT Sports will have tennis rackets and accessories for you to try and buy at very competitive prices. Due to Cricket and Rugby events taking place on the day, parking availability in the grounds will be limited. A very warm welcome to York Tennis Club, set within the picturesque grounds of York Sports Club at Clifton Park located just outside the centre of the beautiful city of York. Celebrating our 51st year, we are one of York’s premier clubs, testified by our success in local and county leagues over many years, an active programme of social tennis, LTA Tennismark accreditation and an extensive coaching programmes available to junior and senior players of all standards. The club however, is so much more than its superb courts and facilities, as it has friendly and welcoming members who nurture an informal and sociable atmosphere, on and off the court. Please take a moment to browse our website to find out more about our club and drop us a line on our ‘contact us’ page, we’d love to hear from you. 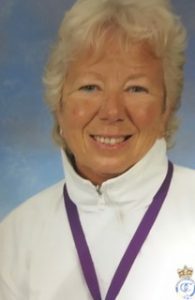 Congratulations to Margaret Whitehead our Club Chair, the Winner of the 2018 Yorkshire Lifetime Achievement Award from Yorkshire Tennis, and the Lawn Tennis Association. Margaret will represent Yorkshire in the North Finals in March. The winner going on to the Nationals at Wimbledon in 2019. Wednesday – Club Play from 6pm, all 5 floodlit courts, members attending are expected to join in. At all other times not listed above it is expected that courts will be available. We are always happy to welcome new members and to get as many people participating in the wonderful game of tennis. If you are new to tennis or a seasoned performer, we are sure our coaching programme provided by York Tennis Academy can help take your game to the next level. Founded by Head Coach John Moore, York Tennis Academy provides premium tennis coaching for all ages and abilities, from beginners to players competing internationally. York Tennis Academy aim to supercharge the game of every player and make them feel like the racket has ‘come to life’ in their hand and play beyond the level they thought possible. The chief aim of the club is to be fully inclusive of all standards, to promote a love for tennis and have fun, both on and off the court.